The SAG equation is a Fick diffusion equation of a specie c ∂c∂t=∇2c which can be solved with the reaction–diffusion solver. Concentration at time t+dt, t and maximum difference between the two. We will store the statistics on the diffusion solvers in mgd. On the top boundary the species concentration is imposed. And there is no flux on the right and left boundaries. The domain is the square box [−5:5]×[0:10]. We use this as initial condition. We first set the timestep according to the timing of upcoming events. We choose a maximum timestep of 0.2 which ensures the stability of the reactive terms for this example. We use the diffusion solver to advance the system from t to t+dt. If the difference between c and cold is small enough, we stop. 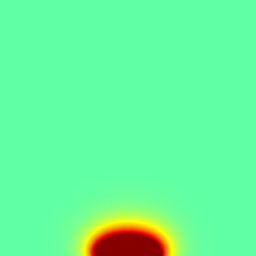 At the end of the simulation, we create an image of the error field, in PNG format. We compare the exact and computed solutions for a cross-section at x=0. We also display the concentration flux divided by the reference flux bi/(biL0+1). N. Dupuis, J. Décobert, P.-Y. Lagrée, N. Lagay, D. Carpentier, F. Alexandre (2008): “Demonstration of planar thick InP layers by selective MOVPE”. Journal of Crystal Growth issue 23, 15 November 2008, Pages 4795-4798. N. Dupuis, J. Décobert, P.-Y. Lagrée , N. Lagay, C. Cuisin, F. Poingt, C. Kazmierski, A. Ramdane, A. Ougazzaden (2008): “Mask pattern interference in AlGaInAs MOVPE Selective Area Growth : experimental and modeling analysis”. Journal of Applied Physics 103, 113113 (2008).